You walk into your teen’s room and wonder if perhaps a dirty laundry bomb has gone off. The floor is practically invisible beneath piles of laundry, books, papers, and dishes. The bed is unmade and the desk is covered in clutter. The closet doors won’t even close all the way because the clothes have begun to migrate out into the room. “It’s MY room – if you don’t like how it looks, then close the door,” your teen shouts. “It’s MY house – as long as you live under my roof, you follow my rules,” you reply. And thus the endless cycle begins. In addition to lacking these cognitive skills, teens are also exerting their independence. Their messy bedrooms are not intended to be a personal attack against their parents, but are often a way of demonstrating a teen’s individuality and independence. From a teen’s perspective, the bedroom is often the only space in the world that they can call their own; as a result, teens often grow very territorial and resent any parental attempts to control their space. But although there are clear developmental and cognitive reasons for messy teen bedrooms, parents shouldn’t simply throw their hands in the air in resignation. Although it may seem like a fight you can’t win, the messy bedroom argument is still worth having. A messy bedroom is not merely a sign of teenage independence or of a lack of cognitive skills, but also a sign of a lack of willpower. Although most wouldn’t consider a lack of willpower as a teen to be a tragedy, studies have shown that willpower early in life is one of the best predictors of future success, more so even than intelligence in many cases. This might seem counterintuitive as people have long thought that raw intelligence was the most important attribute for success, but intelligence alone is simply not enough. After all, the smartest kid in the world won’t get very good grades without exerting enough willpower to complete homework assignments, and the smartest adult in the world won’t get very far in the workplace without the willpower to complete tasks in a timely manner. Willpower and a clean bedroom can be a bit of a Catch-22. In the book Willpower by Roy F. Baumeister and John Tierney, the authors described experiments in which groups of people were led into one of two rooms. One room was neat and the other was a pigsty. Participants in both rooms were given tests that measured their self-control. The people in the clean room were more willing to wait for a reward – they preferred more money in a week than less money now, and selected healthier foods. The people in the pigsty were all for instant gratification – they preferred less money now and chose junk food over healthier options. So it would seem that a clean room can improve willpower, but it takes willpower to clean a room. The good news is that additional studies have shown that willpower is like a muscle – the more you consistently use willpower, the more willpower you have. The authors of Willpower suggest that people slowly build up the strength of their self-control through small but regular exercises. 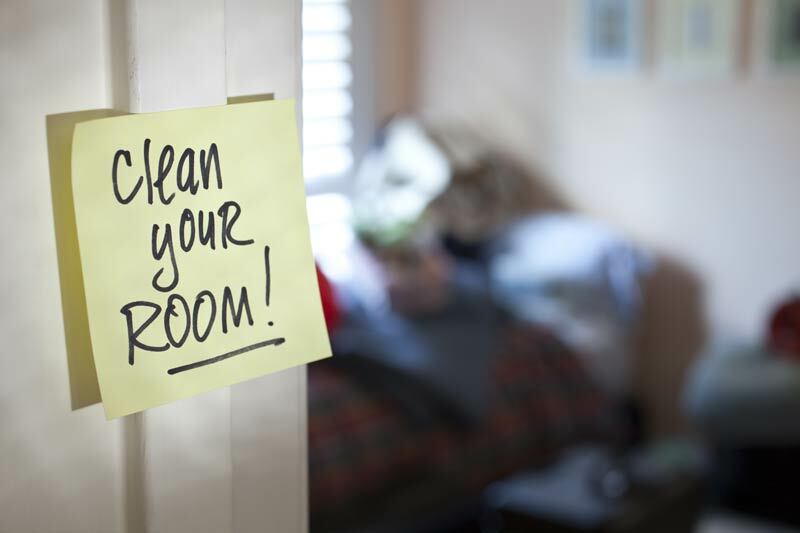 What better way for your teen to build willpower than through maintaining a clean bedroom? Don’t nag: Galling as it might be, your teen will probably respond more favorably if you talk to him the way that you would want your boss at work to talk to you. At this age, teens are eager to rebel, so don’t give them something to rebel against. Set reasonable expectations: Your kid’s room probably won’t ever be immaculate. If you set the bar too high, you set your teen up for failure. Instead, set out reasonable cleanliness standards (i.e. dirty clothes in the hamper, clean clothes in the closet, dirty dishes in the sink, etc.) that your teen is more likely to actually meet. Use a carrot: Teens respond to praise better than to punishments, so try to use incentives before resorting to threats. Money or extra privileges are always good motivators, but even simple praise can sometimes go a long way. Try a stick: When the carrot doesn’t work, use a stick as a last resort. Threaten to take away privileges (i.e. no more rides to the movies, no more internet usage, no more cell phone, etc.). But if you make threats, you have to follow through!